alaTest has collected and analyzed 31 reviews of Sony Handycam DCR-SX44. The average rating for this product is 4.3/5, compared to an average rating of 4.0/5 for other Camcorders for all reviews. People are impressed by the image quality and price. The zoom and portability are also appreciated. We analyzed user and expert ratings, product age and more factors. Compared to other Camcorders the Sony Handycam DCR-SX44 is awarded an overall alaScore™ of 77/100 = Good quality. 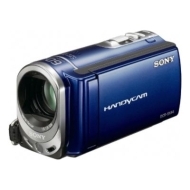 alaTest has collected and analyzed 7 user reviews of Sony Handycam DCR-SX44 from Amazon.com. The average user rating for this product is 4.0/5, compared to an average user rating of 3.9/5 for other Camcorders on Amazon.com. People are impressed by the usability and portability. The image quality and price are also appreciated. The Sony DCR-SX44 is an Ultra compact camcorder from Sony with an impressive 60x optical zoom. But it shoots below average standard definition video and its ineffective image stabilisation makes it impossible to shoot watchable videos at the tele end. i just got this camcorder today and i absolutly love it! it is so small and cute! THe blue is actually more purple.make sure you get the dvd cds 5 gb or higher not anything lower. they dont workd so i just used windows dvd burner and it worked great!! I received this for Christmas and am thrilled so far! !